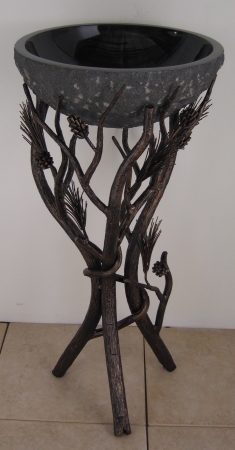 Pine boughs and needles, created from forged iron, add a touch of nature to the design of this sink pedestal. The addition of pine cones gives a realistic feel to the piece and adds beauty to the functionality. Available in a variety of finishes and compatible with different sink bowls, this is a great choice for a powder room or bathroom.